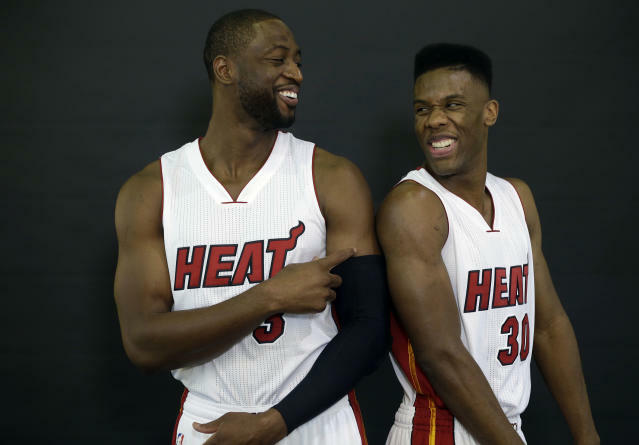 Miami Heat guards Dwyane Wade, left, and Norris Cole, right, joke as they poses for portraits during NBA basketball media day, Friday, Sept. 26, 2014, in Miami. There is no way to console a team that just lost LeBron James. The best player of his generation served the Miami Heat in countless ways, contributing in various areas of need while simultaneously serving as the focal point of everything the team did at both ends. He could score, pass, rebound, defend inside or outside, and delay questions about the continued viability of the Big Three for as long as his performances spurred his team to victory. James didn't do enough to defeat the San Antonio Spurs last June, but falling to a squad with so many options highlighted just how reliant Miami had become on his greatness. As the Cleveland Cavaliers learned in 2010, living without LeBron can be a difficult experience. So it's something of a minor miracle that the Heat appear to be in relatively decent shape heading into 2014-15. Two members of the Big Three have returned, with Dwyane Wade making a lower rate of $31 million over two years and Chris Bosh back on a five-year, $118 million mega-deal. Neither deal looks like particularly sound business in a vacuum — Wade looked over the hill in the postseason despite purposefully sitting out games throughout the season and Bosh will be paid a massive salary when he's 35. For at least one year, though, they give the Heat hope of retaining its relevance. Wade is not close to the player he once was, but he isn't a total disaster and could regain some form now that he is back to being the unquestioned face of the franchise. Meanwhile, Bosh can return to his pre-Miami status as a franchise's top producer, a role he should be able to fill effectively. He averaged at least 22 points and 10 rebounds three times in his final four seasons in Toronto, and he's arguably added more facets to his game in his four years in Miami. Bringing back Wade and Bosh (or really just the latter) also afforded the Heat enough cachet on the market to woo Luol Deng as a replacement for James on the wing, where he figures to defend many top scorers and contribute reasonable production on offense. There's some question as to what Deng has left after years of being overworked by Tom Thibodeau and mismanaged by the Chicago Bulls' medical staff, but he's still an asset on a veteran team with two clearly superior scorers. The best way of praising the post-LeBron Heat is fairly backhanded — more than anything, they appear to be a functional basketball team. Wade and Bosh are well-respected multiple-time All-Stars who know how to play together, Deng is a very good secondary player, role players such as Udonis Haslem, Mario Chalmers, Chris Andersen, and rookie point guard Shabazz Napier seem to know what they're supposed to contribute, etc. Plus, head coach Erik Spoelstra has transitioned from a wunderkind handed the most immediately impressive free-agent haul in NBA history to a two-time champion with a deserved reputation for putting his team in a good position to succeed. The Heat are no longer championship contenders. However, their likely appearance in the postseason ensures that the franchise will not fall into obscurity any time soon, which is its own sort of success in today's NBA. The team is obviously worse, but the brand will survive. It remains to be seen how long it will be until they can leverage that image into another title. Well, no, obviously not, but Pat Riley did save face. Bringing back Wade at the non-max and Bosh at all allowed the Heat to present themselves as something not entirely terrible, which in turn led to the addition of Deng, the retention of the Birdman, and a decent feeling surrounding the franchise that definitely didn't exist for the Cavs when they faced their own King-less future. Also, while trading up to draft Napier as a way of pleasing James now looks very silly, the Heat did get a promising young guard with a history of coming up big in crunch time. Again, it's not like the Heat reloaded and return as world-beaters, but they succeeded in maintaining a base level of confidence that will allow them to make moves of relevance in future seasons. That's meaningful in itself. Deng did not make the All-Star team last February for the first time since 2011, but his season was actually in keeping with the two that preceded it. Deng hasn't shot especially well for three years, registered a PER within 1.0 hollingerino (in either direction) of the league standard 15.0 for the fourth-straight season, and saw his numbers dip once he was traded from the Bulls to the far less successful Cavaliers. Caveats aside, Deng should be a fine addition to the Heat, in large part because he has versatility to give the Heat options and a veteran's approach to the job that should fit in with the existing roster. If Riley thinks he signed a likely All-Star, then he's kidding himself. The good news is that he'll work fine with this group anyway. There are a lot of things the Heat will do worse without LeBron, but that doesn't mean the Heat can't be solid in many of those same areas. Rather, the biggest problem with the team may be in its construction. There's no telling how many games Wade and Deng can play at a high level, because the former won't be able to count on scheduled rest days without James and the latter played so many games through injury under Thibodeau that he sometimes appears to be held together with tape and bubble gum. If neither plays to their reputations, then Bosh may have to exceed his Toronto Raptors-era production for the Heat to meet their goals. Wade was savaged on Twitter for his poor performances during last year's playoffs, often deservingly. Yet it's important to remember that he gets much of this criticism because he was once so fantastic, a player who carried his team to an NBA championship and came back looking better after injuries derailed his 2007-08 season. If you forget his peak, then Wade's 2014 postseason isn't quite so awful — he scored at least 23 points in four straight games from Game 5 against the Brooklyn Nets to Game 3 against the Indiana Pacers and shot reasonable percentages in the first three NBA Finals contests before crashing in Games 4 and 5. If he stays relatively healthy, plays 70 games, and averages 20 points per game, then Wade can reclaim some of his standing around the league. A failure to do so should keep him in his role of punching bag for another year, deserved or not. Danny Granger has accomplished enough in his nine NBA seasons to retire with a very successful career, so it's not as if a solid campaign would allow him to reach some new level. Still, he can return to a level of relevance following two seasons in relative anonymity. Playing only five games during the Pacers' breakout season of 2012-13 diminished his role with the team considerably, to the point where he could be traded away at last year's deadline and have the impact be discussed primarily in terms of chemistry rather than his on-court contributions. With Miami, Granger has an opportunity to reestablish himself as a bench scorer and valued shooter. That's a ways from his 2009 All-Star form, but a sizable leap from his recent fringe status. If anything, he's looking to break back in to where he once was. Bosh becomes a 22 and 10 player again with no trouble, Wade looks spry with a bump in usage and plays 70 games, Deng returns to form with a playoff team, Spoelstra assembles the role players effectively, and the Heat end up on the other side of a LeBron beatdown in the conference finals. Bosh is more 18 and 8 than 22 and 10, Wade continues his steep drop towards retirement, Deng's joints turn to dust, and the Heat turn into one of those teams they used to sweep in the first round of the playoffs.